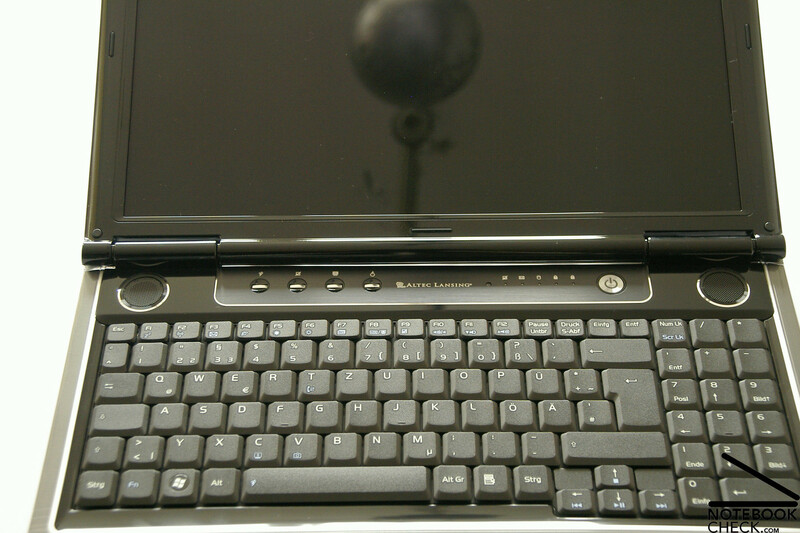 Even after the manufacturer Asus had got the stone rolling in the netbook sector with its Eee PC 701 only just a year ago and could steadfastly compete with well-known opponents like Acer, MSI, Fujitsu Siemes, etc., the Asian manufacturer Asus didn't only concentrate on improving the Eee PC, but has also expedited some things in the 15 and 17 inch sector. There hasn't been much change optically since our tests of the M50S and the M70S. 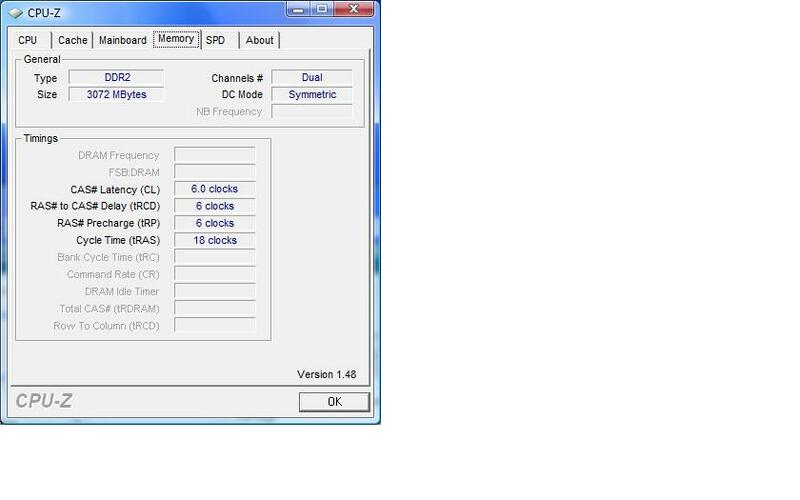 Therefore, our Asus M50V test model has the same design as the already tested M50S model. 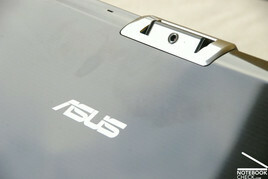 Asus names it the "Infusion" design. The notebooks are also presented, like both of S-models, in a grey and black high gloss surface finish. As far as the inner workings are concerned, Asus has equipped the M50V with a Core 2 Duo T9400 with a 2.5 GHz clock rate, a mainstream GeForce 9650M GT graphic card from nVidia with 1024 MB VRAM, four GB RAM and a 320 GB hard disk. More precise information to the single tests will, as usual, follow in the proceeding of the test report. 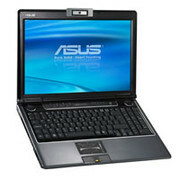 Asus also additionally puts, besides the notebook itself, a small and space saving notebook mouse, as well as a high quality notebook case in the delivery box. With that, you can get started mobile with the newly attained M50V right away. Those who have read the reviews of the M50S and M70S will notice that the M50V doesn't differ much in looks from these. 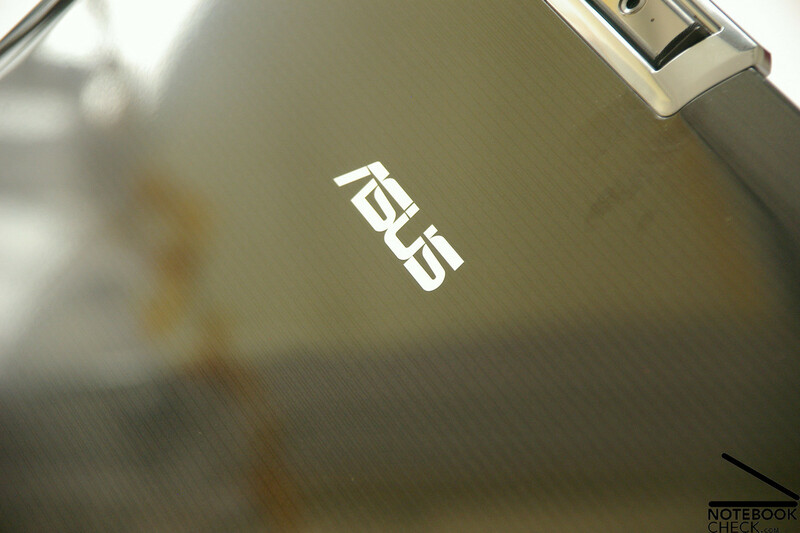 Asus treated the M50V to the same high quality surface finish as already the M50S and the M70S. 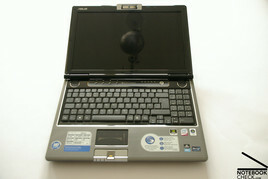 The various chrome strips, the reflective plastic components as well as the lined pattern, which Asus refers to as "Infusion", were also used on the M50V multimedia notebook. The "Infusion" design in a high quality finish is already familiar to us. 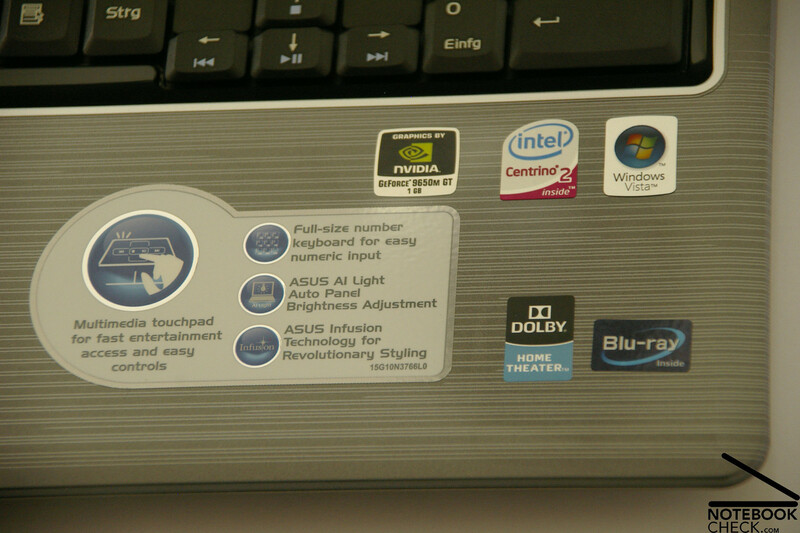 Generally, the Asus M50V appears to be of very high-quality, which is even more supported by the design and coloration of the notebook. The case can not only score in regards to optic, but also with its haptic. The base unit leaves no doubt about the generous use of plastic in the palm rest area, but looks very grand. Positive is, that despite the high-gloss surfaces, smudge by means of fingerprints stay very much within a limit. 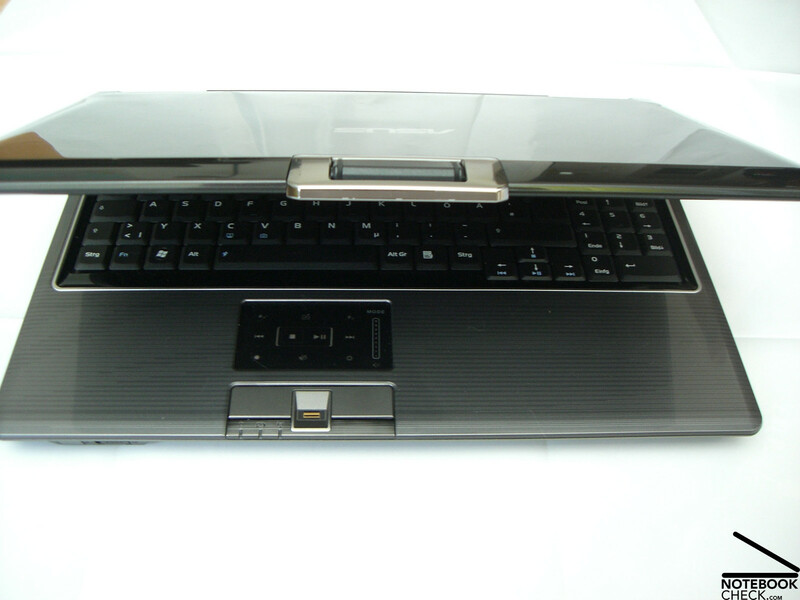 The Asus M50V could also score, despite the plastic case, in consideration of the case stability. The plastic case barely showed any weaknesses under pressure. The observed deformations could be reduced to such a low amount that they can be neglected. Barely any, up to no creaking or cranking noises could be conceived when handling the test sample. Merely the backside of the display lid couldn't keep up with the rest of the case stability. The surface gives away considerably at point pressure in the center area of the display lid. This is the case of most plastic-made notebook cases, though. When opening or closing the display, no creaking noises were noticed, either, which might have dimmed the so far good impression of the Asus M50V. Two hinges on the right and left side of the notebook are responsible for the stability of the 15 inch display in an opened condition. These bid enough hold to keep the display tight in position and prevent almost every luffing of the LCD. While the M70S and M70V have to resort on a double latch closing system in order to keep the display safely closed, the smaller M50V can abstain from any kind of closing system due to the smaller display size. The display closes very well anyway and lets itself also be unfastened with a simple opening of the display again. The Asus M50V offers all of the currently needed connections that a modern 15" multimedia notebook should have and even a bit more. 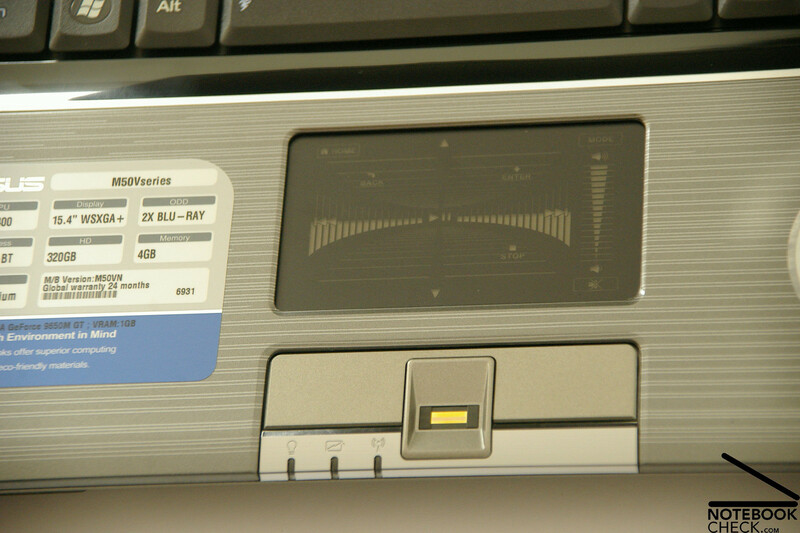 Besides the four USB 2.0, a Firewire and an analog VGA-out to connect external monitors, the M50V additionally has a HDMI and an eSATA connection. The offered connections are very well distributed along the left and right side, as well as the back of the notebook. That's not being enough, though. 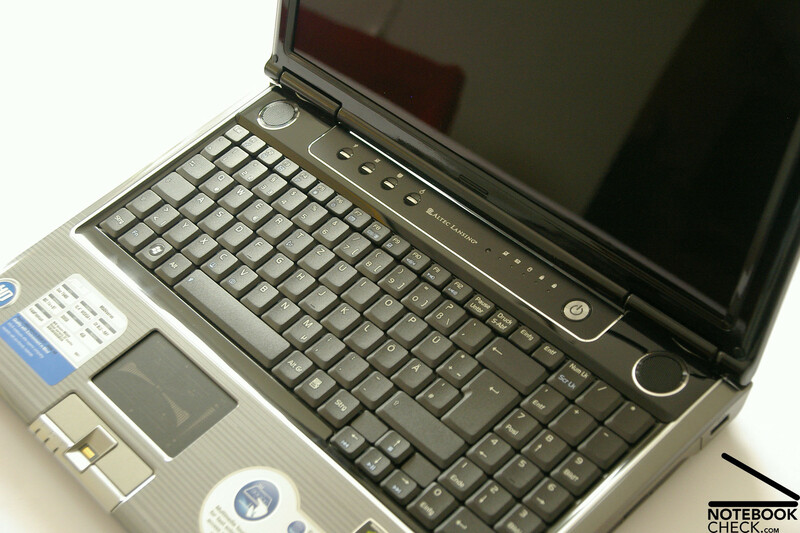 The multimedia notebook provided for testing reasons, was also rounded off with an integrated Blu-Ray drive to play high definition videos. 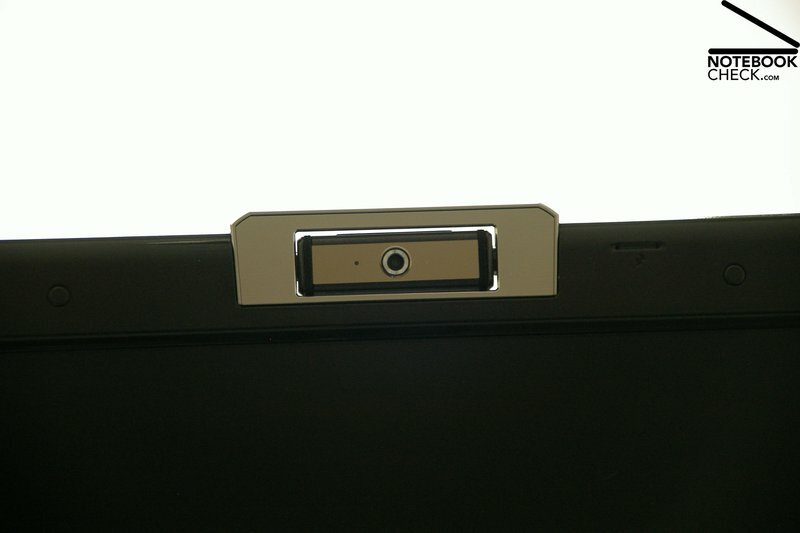 As in the meantime most notebooks, the M50V also has a 1.3 Megapixel webcam with an integrated array microphone only a few centimeters right of the camera. The built in camera is additionally pivotable by 180 degrees, at least in the vertical plane. Video conferences are therefore no big problem for our test device. 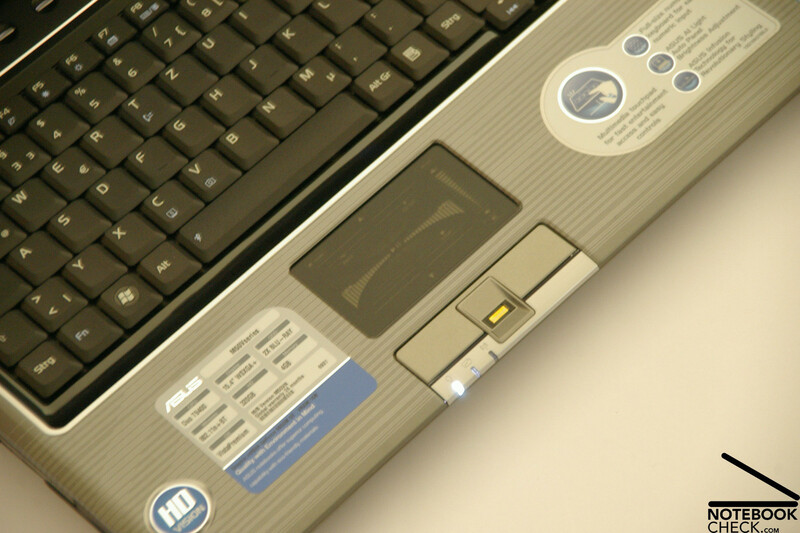 For communication with other computers and the World Wide Web, the M50V has a LAN adapter of type Realtek RTL8168C(P)/8111C(P) Family PCI-E Gigabit Ethernet NIC and a WLAN module from Intel (Intel(R) WiFi Link 5100 AGN). Despite the form factor, the 15 inch notebook has a separate numerical block. The manufacturer made sure that the keys were kept in the original size and weren't cut back for space reasons. 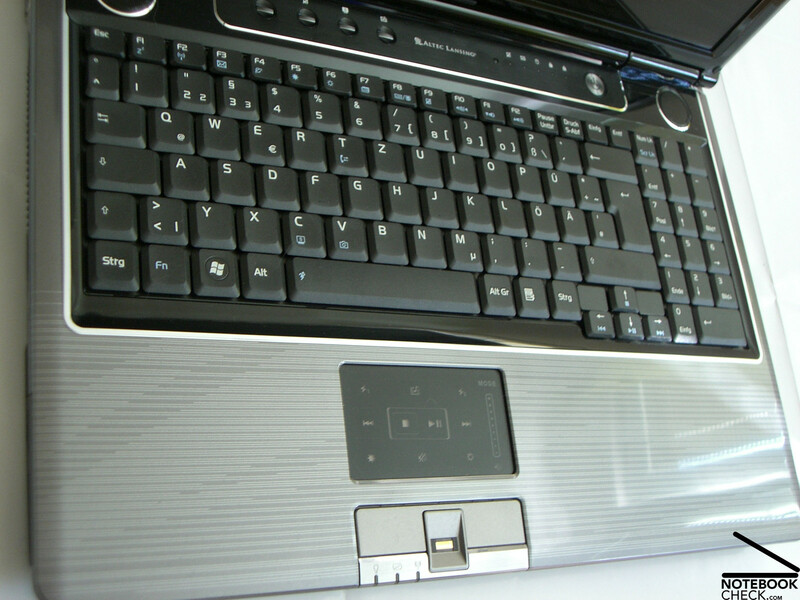 Therefore, no time-consuming accommodation period is needed, to adjust yourself to the keyboard. The optic suffers from this though, because it does make a somewhat jam-packed and overloaded impression. 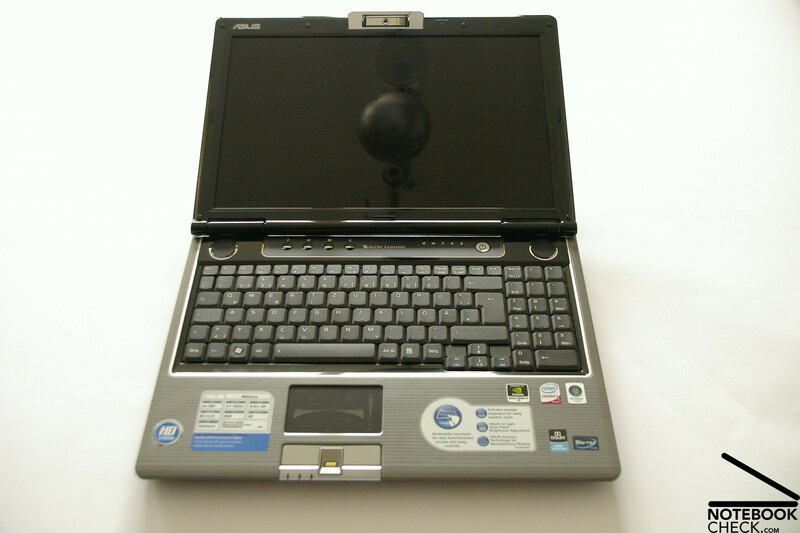 The slightly clattering keyboard of the Asus M50V, similar to that of the M50S model, is rather jerky and bids a palpable pressure point in regards to the typing feeling. 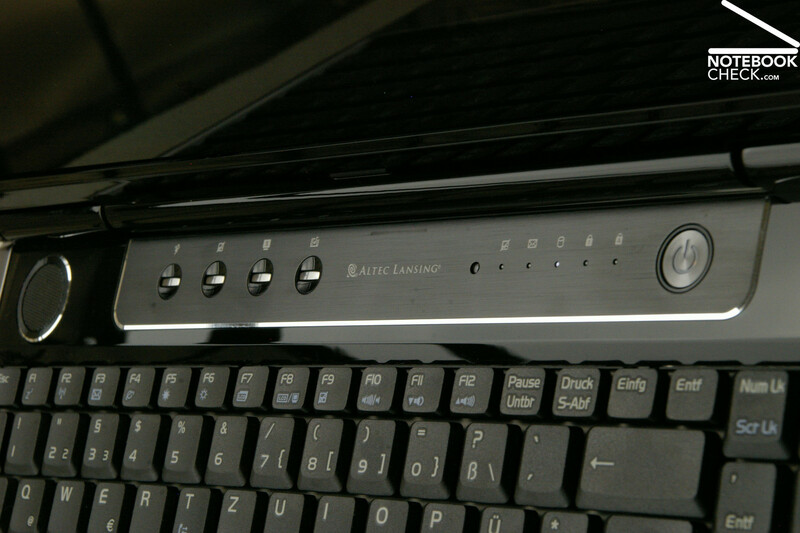 The soundscape is, besides the usual clicking noise, also defined by a more dampened sound when extruding the keys. 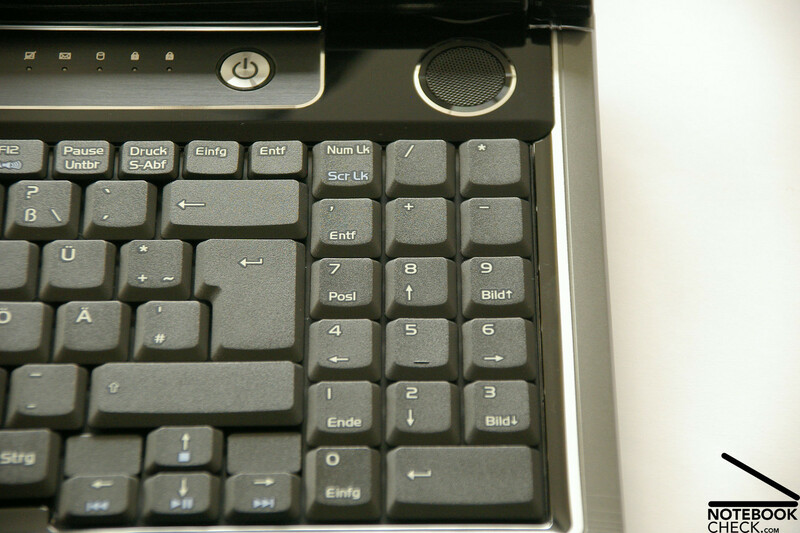 At normal use, the noise stays within a limit when typing, but this can change quickly when typing more forcefully due to the clattering keys. 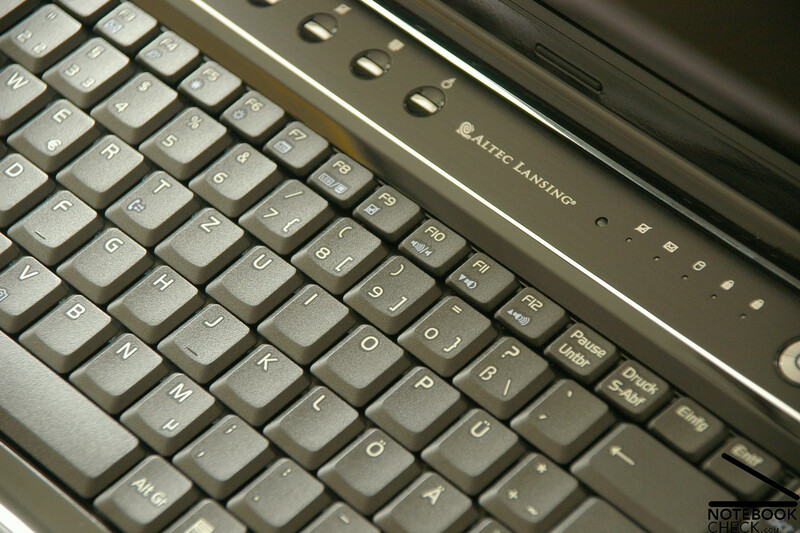 The touchpad is centered under the keyboard, but somewhat decentralized on the case. Especially conspicuous is that the pad is let in fairly deep into the case and you always nudge onto the edges when using your finger to control the mouse. The surface of the pad turned out quite pleasingly as it bids optimal gliding traits. 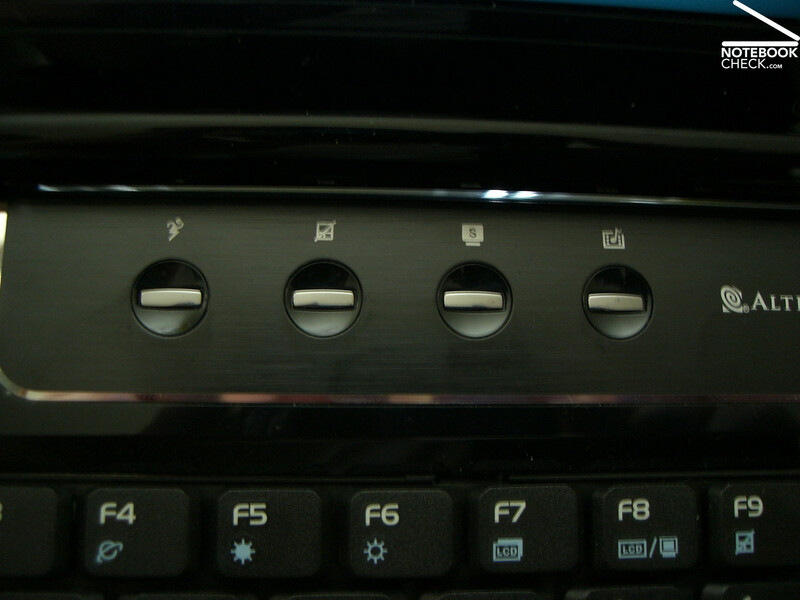 Besides the marked scroll area, the touchpad additionally offers a dual mode function. 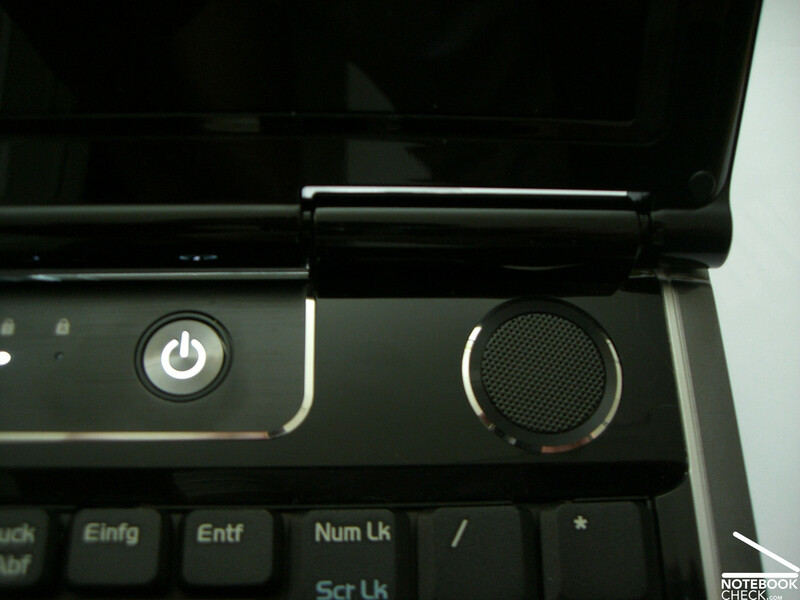 With a finger tip on the lettering "Mode", single symbols on the pad light up and are therefore highlighted. In this operating condition it is then possible to control multimedia functions or to manage the sound playing volume with the touchpad. As already usual in most multimedia laptops, the Asus M50V, as well as the M50S and the M70S, offers a few hot keys, for instance, for choosing the performance profile or also for a quick deactivation of the touchpad. 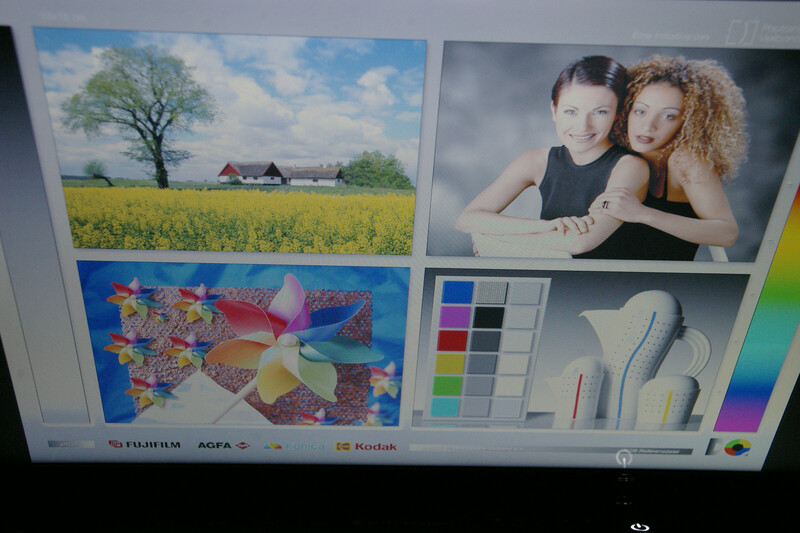 The multimedia notebook has fairly highly reflective 15.4 inch WSXGA+ LC display with a pixel grid in a ratio 16:10 and a maximum resolution of 1680 x 1050 pixels. 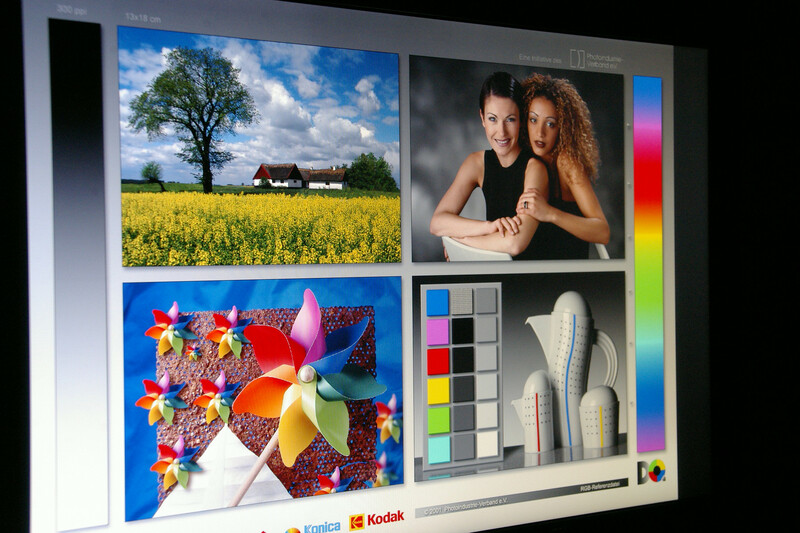 The M50V bids a considerably better overview in comparison to other WXGA displays with that, making especially working with multiple windows at once or even the use of software with various tool boxes easier. Thanks to the reflective display, the from us tested sample subjectively bid vibrant and saturated colors. This became particularly evident in gaming, in a positive way. 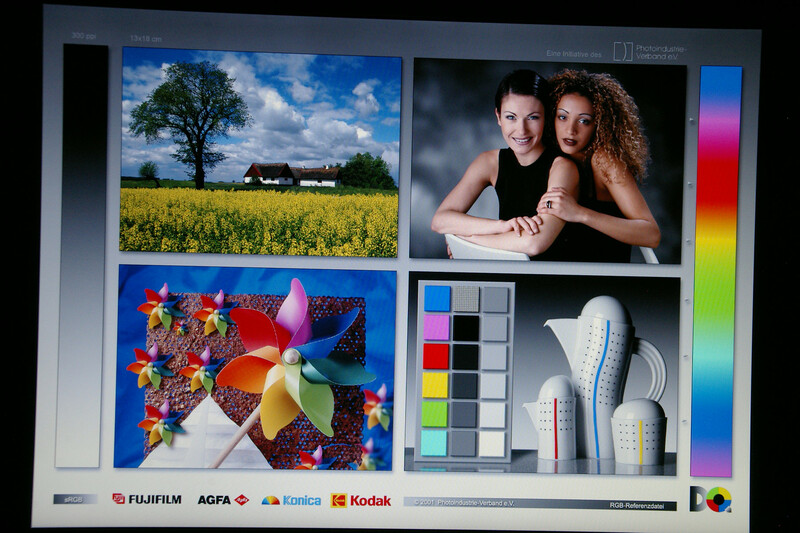 Furthermore, the test sample delivered clear and sharp images throughout the tests. Streaks on the screen weren't noticed by us, even in fast games like Crysis or World in Conflict. As the already from us tested M70S and the M50S models, our ASUS M50V test sample had an integrated brightness sensor which adapted the brightness of the display automatically to the surrounding light. This feature can be simply and quickly activated/deactivated on demand with the key combination Fn + A. In the M50V we distinguished a display brightness of a meager 155.5 cd/m2 in the left lower corner up to a maximal brightness of 214.8 cd/m2 in the central area of the screen. The built in screen is barely suitable for outdoor use, especially due to the glare surface. Therefore, strong reflections in interiors with adverse lighting conditions have to be counted with. As to the offered viewing angle stability in both the horizontal as well as the vertical viewing area, the display of the Asus M50V has a sufficiently large working area. However, at too much of a deviation from the ideal angle, slight contrast losses set in, followed by reflections. Like the M50S and M70S colleagues, the Asus M50V model tested by us belongs to the league of the high performance multimedia notebooks. 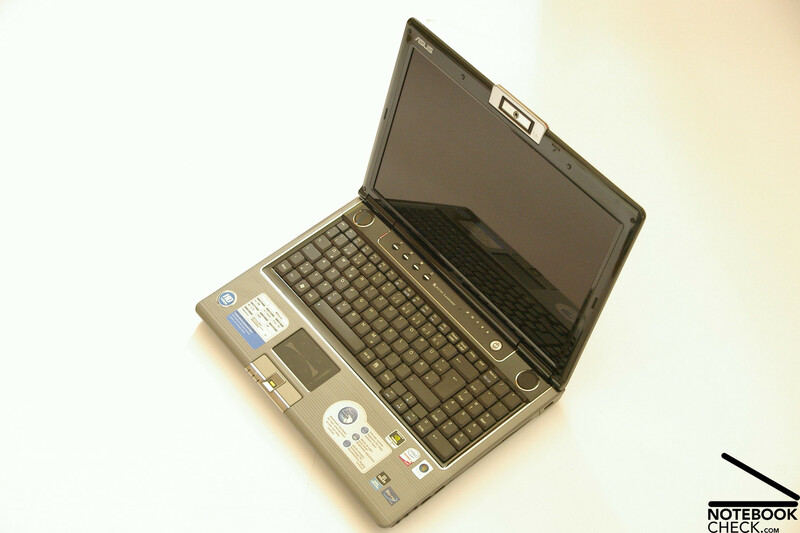 A Core 2 Duo CPU, the T9400 with 2.5 GHz from Intel, a GeForce 9650M GT equipped with 1024 MB VRAM, four gigabyte DDR2 RAM and a 320 hard disk from Hitachi, is responsible for the performance. Office applications, music playing or watching a DVD is no challenge for the M50V. 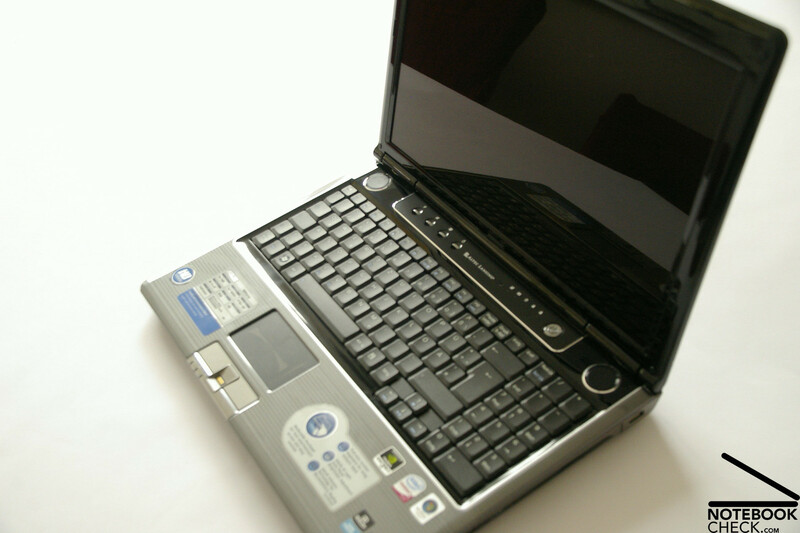 Even surfing in the internet is no problem for any modern notebook. In order to demonstrate and compare the performance differences of various notebooks anyway, we ran programs like PcMark05, Cinebench R10 and also the new PcMark Vantage on the Asus M50V. In the PcMark05 run through we received a good 6410 points and with the current PcMark Vantage a overall evaluation of 3623 points. The Cinebench R10 was, as usual, conducted in the single and multi rendering as well as testing the Shading performance. The M50V received an evaluation of 2816 points in the single-rendering, while the notebook cut off with 5231 points in multi-rendering. Cinebench awarded the M50V with a whole 4118 points for the shader. We also wanted to find out what the preinstalled operating system Windows Vista Home Premium from Microsoft says to the test device. The performance indicator was at an overall total of 5.0. For the single components, Vista awarded 5.4 for the CPU; 5.9 for the RAM; 5.0 for the GPU in applications; 5.3 for the GPU in gaming and 5.2 points for the mass memory from Hitachi (Hitachi HTS543232L9A (320 GB)). This operates with 5400 rotations per minute and has a memory capacity of 320 GB which should prove sufficient for storing pictures, music, films or even games. With the eSATA connection you can additionally enlarge the storage capacity with an external hard disk, if necessary. 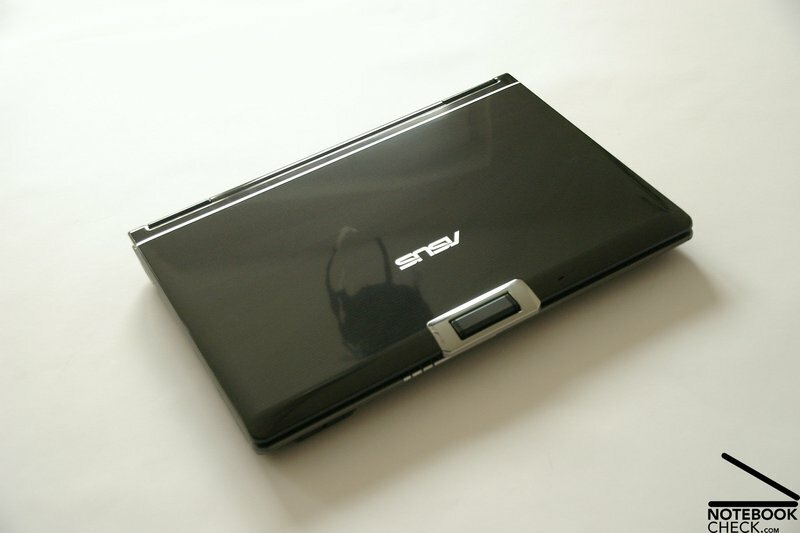 Even if the Asus M50V was constructed with the main view on being a multimedia notebook, the integrated hardware is very much capable of offering the user quite a bit of performance in the gaming sector. Equipped with a Core 2 Duo T9400 with a 2.5 GHz clocking, a mainstream graphic card of type GeForce 9650M from nVIDIA with 1024 MB VRAM, four GB RAM and a 320 GB hard disk, the notebook offers everything you need to play the one or other game on the M50V – and this will be shown in the run through of the 3DMark and the following benchmark tests. In the quite outdated 3DMark01 and 3DMark03 benchmark tests from Futuremark, the M50V passed with a score of 25005 and 13117 and didn't prove to be a problem for our test candidate. 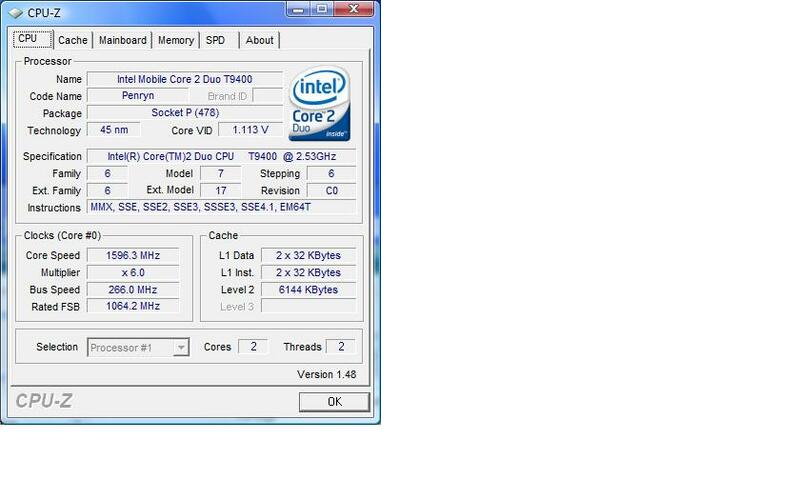 3DMark05 and 3DMark06 rewarded the Asus M50V with 8370 and 4194 points. The new 3DMark Vantage would have actually been planned here, as well, but for reasons we can't explain this benchmark test could not be executed and the test ended already at the start with an error message. Let's get to the practical gaming qualities of the M50V now. "Doom 3" ran as smooth as silk and stable with an average of 56.4 frames per second in the highest setting "Ultra", which is fully sufficient for a smooth gaming experience. 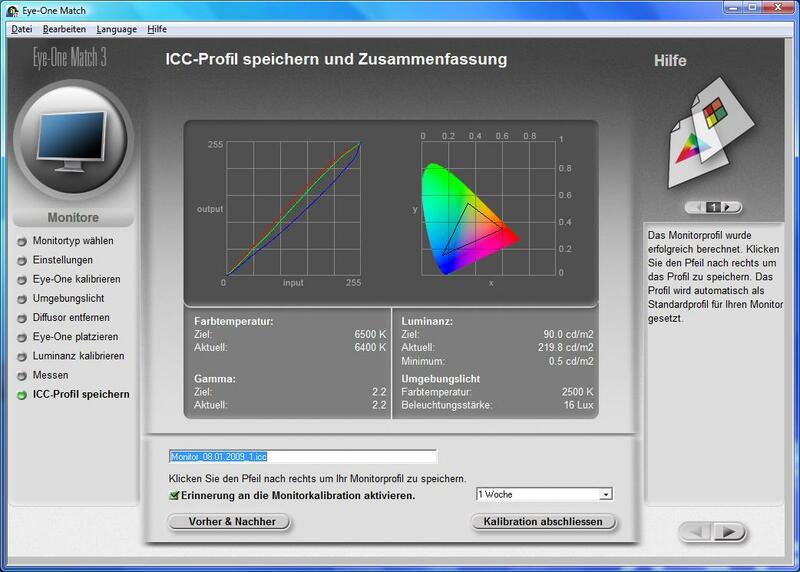 The benchmark tool which is enclosed and integrated in "Crysis" was executed in the resolution of 1024 x 768 in the detail settings low, medium and high. One thing is certain after these run throughs and analysis of the values: The hardware hungry top game "Crysis" is only really playable without stuttering in low settings with 51.73 fps for the GPU and 49.68 for the CPU. 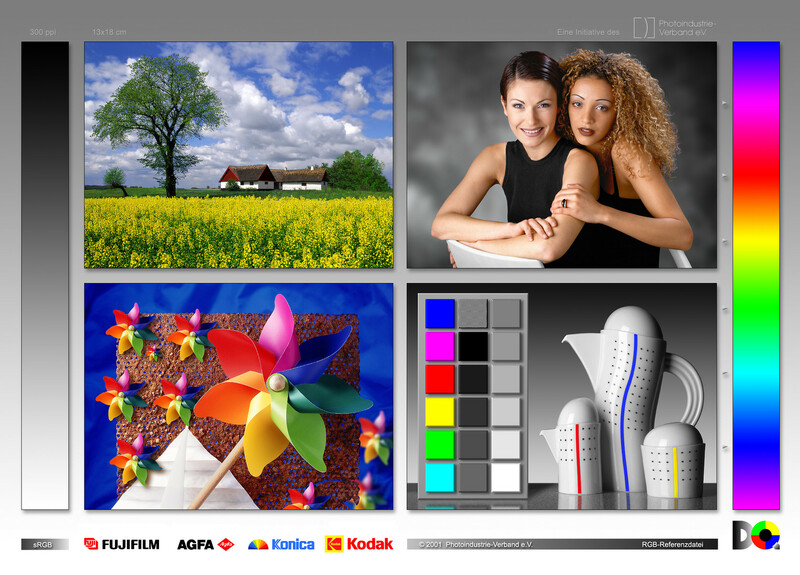 In medium detail settings the images played decreased to a mere 22.49 (value for the GPU) and 21. 72 (value for the CPU) - which is very well still playable but can't be called smooth anymore. 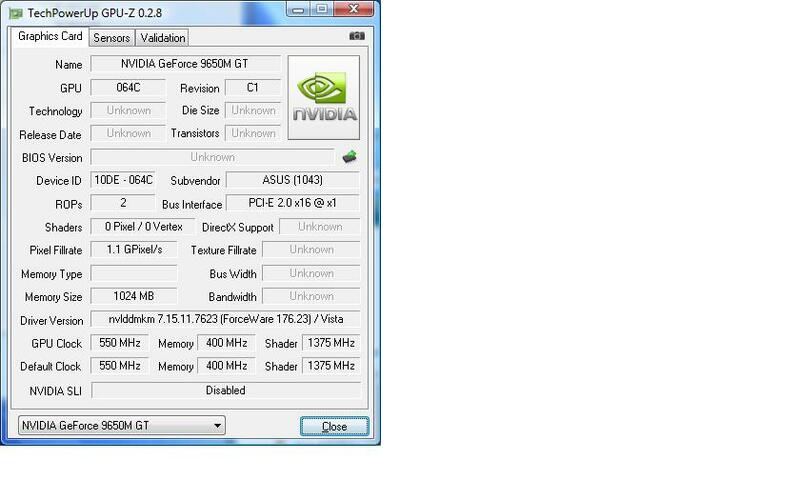 The GeForce 9650M GT finally gave in with frame rates between 11 and 12 fps in high settings. Last but not least, the Asus M50V still has to prove itself in the real time strategy top game "World in Conflict". 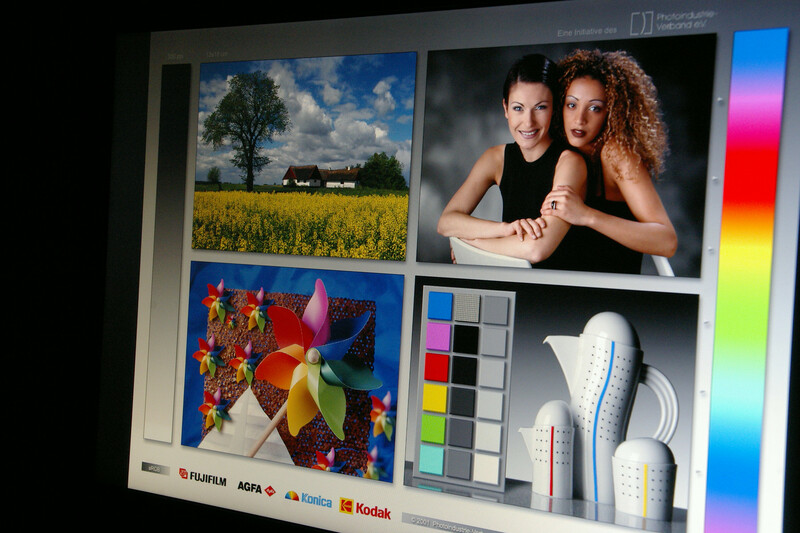 With medium settings (DX9) at a resolution of 800x600 an average of 48 frames per second are possible. In raising the resolution from 800x600 to 1024x768, the fps fall from 48 to 39 frames per second, which makes a smooth playing experience, as before, possible. Even with 1680 x1050 it achieves a satisfactory 26 fps with DireckX9. At high details, which is only possible with DirectX10, the GeForce 9650M GT doesn't even manage to come up with 20 frames per second in the lowest resolution of 800x768. In raising the resolution to 1024x786 or 1680x1050 pixels the frames per second decrease to 15 or rather to an unplayable 9 frames per second. Unfortunately, the M50V can't score in consideration of the system noise emissions. It may just still be possible to call it quiet with an average volume of 33.3 dB(A) in idle use (measured minimum volume 33 dB and maximum volume 34.1 dB) but this changes very fast when the M50V breaks out in a sweat. The built in cooling raises the fan rotation speed in three levels so that the fan works at the highest level with an average noise of a measured 42.3 dB(A) (this also being the maximal volume). The fan noise stays constant and isn't conceived as being a nuisance or nervy, if you aren't too sensitive for this. It looks quite a bit better with the working temperature, though. It stays within a limit in every single zone on the upper side. Four of the nine zones are under the 30 degrees Celsius mark and the other five just slightly cross the 30 degrees Celsius mark. We measured merely 32.6 degrees as the maximal temperature under load in the left center area. The measured temperatures on the bottom side are impressive, too. Only three areas cross the 30 degree mark. The maximum temperature measured by us here was 35.4 degrees Celsius. This still allows for a halfway pleasant working on the lap. (+) The maximum temperature on the upper side is 32.6 °C / 91 F, compared to the average of 36.5 °C / 98 F, ranging from 21.1 to 71 °C for the class Multimedia. The audio for the M50V is taken care of by a very promising sound system from Altec Lansing, as we already know it from the M50S and M70S from the manufacturer Asus. This helps the test notebook to a quite satisfactory sound. Regrettably, the 15 inch model has to do without a subwoofer due to space reasons. Therefore, in regards to sound and especially the deeper tones, the Asus M50V can't keep up with its big brother, the M70V or rather the M70S, which has an integrated subwoofer on the bottom side. We can certify a good mark for the sound of the M50V, anyway. The tones are clear, the volume is adequate and the built in loudspeakers don't start to thud at high volume or bass-prone music. All in all, you can be content with the built in sound system. Whomever the bass is too thin must help themselves with the suitable headphones, unfortunately. The enclosed lithium-ion battery with 11.1volts and a capacity of 4800 mAh helps the Asus M50V to a quite satisfactory mobile battery run time. This brings the maximum runtime in the BatteryEater Readers test, with the maximum of energy savings mechanisms as well as minimal display brightness and a deactivated WLAN module, to an operating time of a good 216 minutes – which equals an runtime of 3 h and 36 minutes. The minimal runtime according to the BatteryEater Classic test (full load, everything activated, maximum brightness) reached a mediocre 76 minutes. 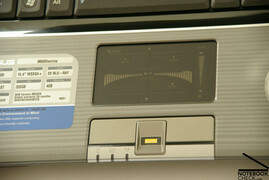 The M50V only reached an average of 96 minutes while playing a normal DVD. Watching a film on a blue HD disk probably will decrease the maximum possible playing time even more. It looks better when surfing mobile over WLAN, though. It reached 140 minutes with an activated energy savings mode and good display brightness. The M50V from Asus offers with its stylishly designed case with chrome and a high-gloss surface an adequate frame for the extensive equipment of the notebook. Therefore, the high performance multimedia notebook M50V from ASUS can't only score with its good workmanship and the offered performance. It also offers, besides the chic and elegant look in the "Infusion" design, technical features and gadgetry that are striking. 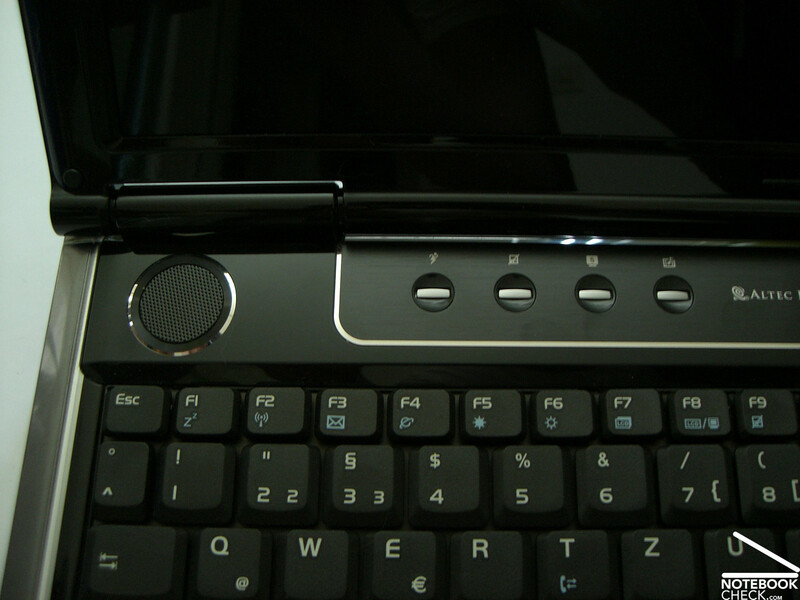 For instance the built in touchpad which serves as a classic mouse substitute in the standard mode but can be switched by the push of the button to the second mode, turning the touchpad into a mini multimedia center from which you can control the most important functions like play, pause, volume, etc. 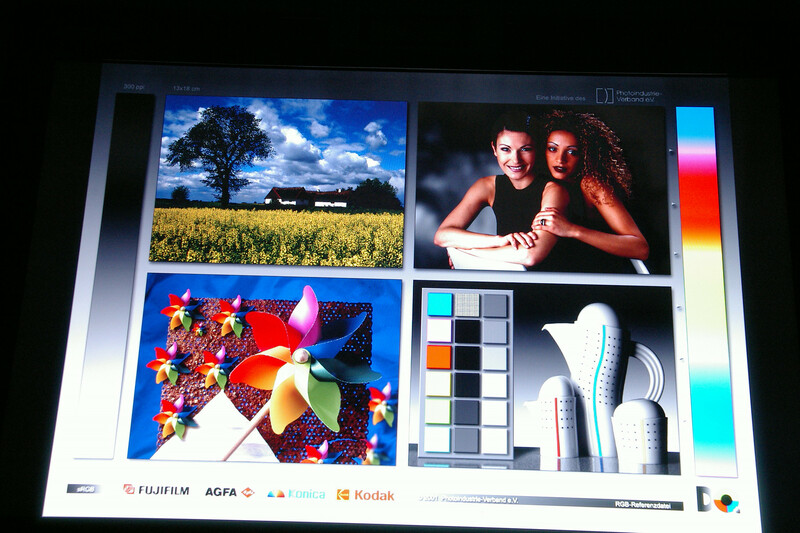 The touchpad looks impressive - especially in darkened rooms because it is illuminated in the multimedia mode. We would want to point out positively the extensive and well thought-out placement of the connection possibilities, which offers beside the standard USB 2.0, Firewire, LAN and modem connections, ports for HDMI and eSATA, as well. 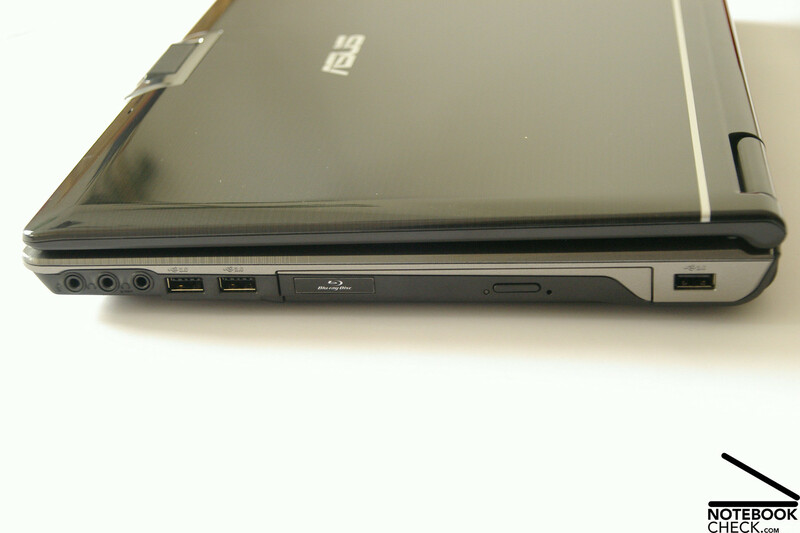 Further highlights, which round off the ASUS M50V, are the fingerprint reader, the Blu-Ray drive, the built in 1.3 megapixel webcam with integrated array microphone and the infra-red interface. In regards to performance, Asus treated the M50V to a Core 2 Duo T9400 with 2.5 GHz a clock rate, a high performance graphic card of type GeForce 9650M GT from nVIDIA with 1024 MB VRAM, 4 GB RAM and a 320 GB hard disk from the manufacturer Hitachi, which provides the notebook with more than enough reserves for everyday tasks. The one or other contemporary game is achievable with this hardware configuration, even if with a partly reduced resolution or detail setting. 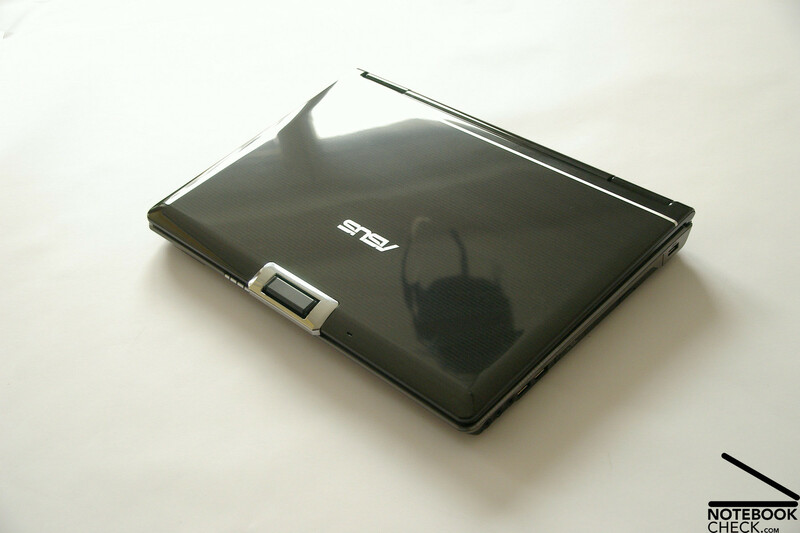 The Asus M50V is primarily to be recommended for multimedia users who set value on a compact case which has a clearly arranged display and also plan to often carry their notebook from A to B. Due to the carrying case included in the range of delivery, you can also do this right away. ...can only be used very restrictively outdoors. ...a very chic and elegant impression. ...with a complete numerical block. 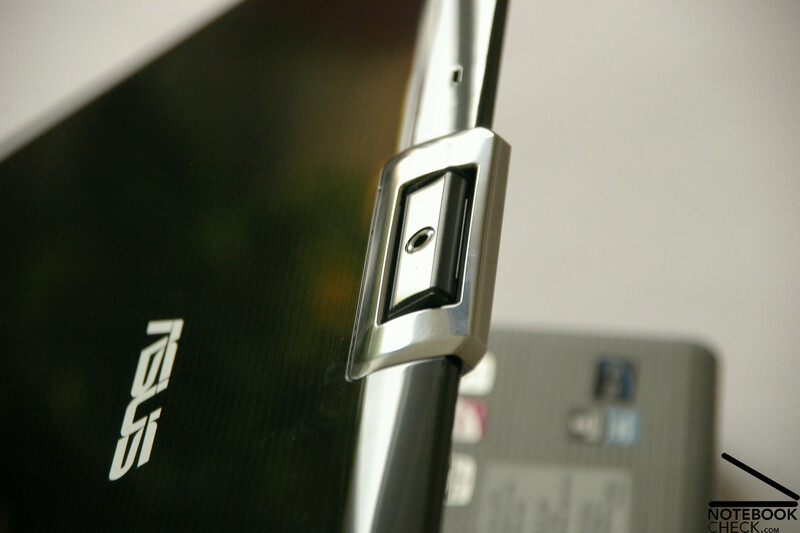 ...for the seemingly fully developed Asus M50V notebook. Subwoofer, subwoofer and subwoofer again. Also a more evenly illuminated display would be nice. Asus sets on a well-tried concept and hits a home-run with it. Barring from the huge in-house competition? 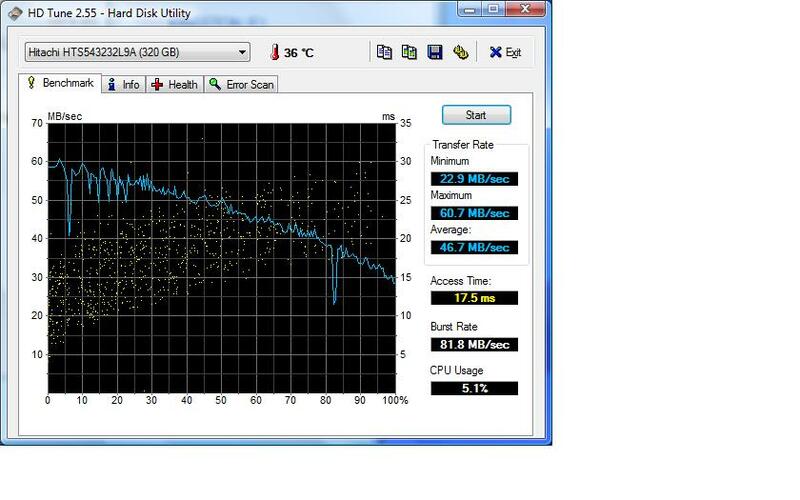 All high performance notebooks in the 15 inch sector, like the Acer 5930G or even the GX620 from MSI, for instance.